Landslide dams are formed when a landslide blocks the course of a river, creating a dam. This can lead to catastrophic consequences, as the dam tends to consist of loose easily eroded material and when the lake fills up and overflows the dam, it can lead to catastrophic collapse and flooding. It took us a while to figure out where the photo in the article was taken from until we realised that there is now a dam further downstream and the river is now a lake, which covers the road that is seen in the photo. Also, Google Earth’s terrain is not very accurate at this location, so the mountains don’t look as steep in Google Earth as they are in reality. Looking on Wikipedia we found that there are a number of other examples of Landslide dams around the world. 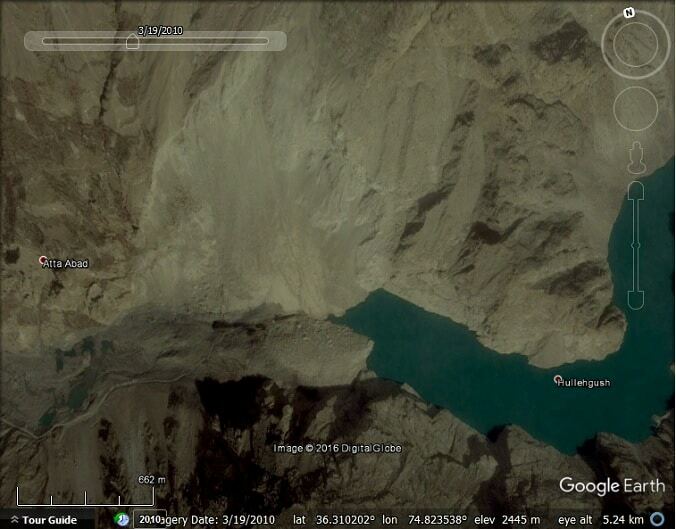 There was a landslide in Tajikistan in 1911 that formed Lake Sarez. At 5 kilometres long, 3.2 kilometres wide and up to 567 metres high, it is the tallest natural dam in the world. There is some concern about its stability and the risk of catastrophic flooding in the event of an earthquake. The landslide dam at Lake Sarez. Water appears to seep through it, forming a river starting at its base. In 1925 there was a landslide in Wyoming, USA, known as the Gros Ventre landslide that formed Lower Slide Lake. The dam failed in 1927, causing deadly flooding downstream, but much of the dam and the lake remain to this day. In Montana, USA there is Quake Lake, formed when an earthquake triggered a landslide in 1959. Quake Lake, Montana. The landslide scar is still clearly visible. This image was captured just a few months after the landslide. Sadly the older imagery doesn’t quite cover the landslide location. In 2014 in Nepal there was a landslide that blocked the Sunkoshi river. Due to fears of catastrophic failure a canal was dug through the dam. Before and after of the Sunkoshi landslide. Another landslide dam was formed in Langtang valley, Nepal in 2015. There is no relevant imagery in Google Earth yet, but you can see it in Landsat imagery here. Thanks for the interesting blog post Timothy. Two weeks ago I was at the Quake Lake slide in Montana and shot a Gigapan showing the landslide and the resulting Quake Lake which is still draining. (Link below) In 1959, I was living in Ashton, Idaho working as an irrigation assistant “Ditch Master”. We felt the earthquake and visited the slide area a few days after the event. For a month afterward the water in the irrigation canal coming out of the Falls River in Yellowstone National Park turned to a milky white color. Another landslide dam in Valley of Geysers at Kamchatka Peninsula,. Landslide was at 2007 and destroy some of the geysers.